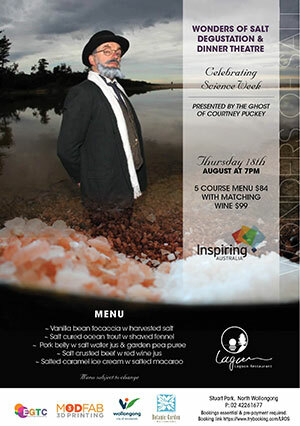 Enjoy the Wonders of Salt Degustation and Dinner Theatre presented by the Ghost of Courtney Puckey and friends. The Wollongong Botanic Garden with The Eaton Gorge Theatre Company is set to entertain and inspire the community during National Science Week with its new show, The Ghost of Courtney Puckey – Salt Maker Salt Maker Extraordinaire! Join Courtney Puckey on a theatrical walk through his estate in North Wollongong. The Wollongong Science Centre and Planetarium will welcome more than 1300 students and there are interesting talks on offer for grown ups as well. There will also be a Wonders of Salt Degustation and Dinner Theatre show on Thursday 18 August from 7pm at Lagoon Restaurant, Stuart Park, North Wollongong. Enjoy a delicious five course Menu for just $84 ($99 with matching wine $). Elsewhere in the region, more than 1300 students are expected to visit the Wollongong Science Centre and Planetarium during National Science Week, a record number of school participants this year. With support form Inspiring Australia, the Science Centre is expanding its outreach program and recently hosted a second successful Adult Discovery event, this time looking at the Science of Chocolate. The sell-out audience enjoyed stories from local chef Shane Dehnam, who discussed the history of chocolate and how it has developed to the decadent delight we enjoy today. Shane enlightened and entertained all as he explained the processes to provide a wide variety of tastes and styles. His presentation concluded with members of the audience being given the opportunity to get hands-on and assist Shane in making a scrumptious Toblerone Gelato. Guests were then invited to indulge in a selection of chocolaty tasting tables where Shane and the Lagoon Restaurant team had handmade a selection of treats including samples of the Gelato. They enjoyed beverages while exploring hands-on exhibits and the evening concluded with marsh mellows and strawberries dipped in the chocolate fountain. The next Adult Discovery event will showcase forensic experts who will lift the lid on the Science of the Real CSI on 26 August 2016. Tickets are available through the Science Centre website. Jackie Randles is the Manager Inspiring Australia (NSW). These events are presented by members of the Illawarra Science Hub and supported by Inspiring Australia.